Newlywed bliss has an ending. When trouble seeps in and bad habits become entrenched, some couples wonder when the "worse" part will end, and the "better" part will begin. Lead Pastor and marriage conference speaker, Kevin A. Thompson has good news: the "better" part is always within reach with eight specific commitments to each other. These commitments lead down the pathway to solve almost any problem marriages face and helps to prevent new ones from occurring. "I loved this book! On each page Kevin offers practical insight and a wonderful ability to communicate hope for your marriage. This book is worth your investment of time. Great insight and life-changing principles." It is the road map to living "happily ever after." Happily is written for couples of all backgrounds and all stages, from serious relationships to those celebrating their 50th anniversary. Kevin's previous book, Friends, Partners & Lovers shows you "what" to do in marriage and Happily shows you "how" to do it. 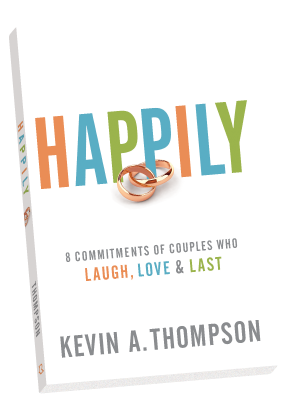 "In his new book, Happily: 8 Commitments of Couples Who Laugh, Love & Last, Kevin A. Thompson has written an excellent guide to help couples achieve a happy, loving, and joyful marriage. Filled with interesting insights and powerful wisdom, it keeps readers turning page after page. Curl up in a comfy chair with a blanket and a cup of coffee—you're going to love this one!" "Certainly, marriage is no fairy tale. But it can be full of laughter and love, and Kevin uses his insight and experience to describe actionable ways we can live out the commitments of the Beatitudes in the day-to-day of marriage. Having witnessed his relationship with his wife, Jenny, firsthand, I find it refreshing to read an honest account of the work and the fun involved in making a relationship not only work but last. I thoroughly enjoyed this book and look forward to putting it to good use in my own marriage." "Marriage is not simply luck; it is a series of wise choices that make up the path to the happily ever after. In Happily: 8 Commitments of Couples Who Laugh, Love & Last, Pastor Kevin A. Thompson has created a practical, doable, and helpful road map so every willing couple can have the directions to journey successfully to a love that lasts--happily!" Kevin A. Thompson (MDiv, Beeson Divinity School) is lead pastor at Community Bible Church, a growing multi-site church with four locations in western Arkansas. Every year he meets with nearly one hundred couples with a range of needs, from pre-marital counseling to navigating the most serious betrayals. His previous marriage book, Friends, Partners & Lovers, was a #1 New Release in Christian Marriage. A marriage and parenting conference speaker, he and his wife, Jenny, have two children and live in Fort Smith, Arkansas. He blogs at kevinathompson.com. For Media Inquiries regarding Happily, please contact Melissa Anschutz at Baker Publishing Group. For all other inquiries or marriage conference availability, please contact Laura Keep at Forte Media Partners. Copyright © 2019 Kevin A. Thompson. All Rights Reserved. Order your copy of Happily then submit your order information here to get bonus materials immediately to start improving your marriage. By submitting your email address, you understand that you will receive email communications from KevinAThompson.com. You may unsubscribe from these email communications at any time.